I think I've started to collect pocketknives, but I'm not sure. This damn post sent me down a rabbit hole of Big Dog forge videos. Lots of interesting stuff. Morakniv knifes on Amazon for $10 to $15 offer amazing quality for the little they cost. Same here. I even paused the vid to examine his lunch in detail. I never saw anybody make damascus steel before. When he started welding saw blades together to start the project, I was astounded. Last edited by atpjunkie; 02-13-2019 at 08:32 PM. ^ How do Damascus compare to kitchen knives like J.A. Henckels and Wusthof? They are nicer to look at, that's for sure. Functionally? It depends. There's more to a knife than just the steel, and a knife I like to use is not one my wife will necessarily like to use. And not all steel of the same type is the same. Not every damascus blade will hold an edge in the same way during use. Keep in mind that actual Damascus steel is a specific thing, and modern Damascus is more of a method (pattern welding). Which can be done with varying alloys, as well as patterns of course. Different alloys, different knife performance. It's complicated, because a lot (but not all) of those nice Damascus-type blades are made with an "Asian" 15 degree edge double bevel, using steel alloys that tend to be just a bit harder (like a couple of Rockwell points), the metal a bit more brittle (there's a metric for this, too, but I forget what it is), and the blades noticeably thinner (maybe 50-60% as thick), than those used by European manufacturers. This adds up to blades that can get a sharper* edge, but which will wear a bit faster, ceterus parabus. "Western" blades were traditionally beveled wider, about 20 degrees or so, and used softer alloys, resulting in blades that are perceived (but see asterisked comment below) as a bit less sharp, but with an edge that will hold up a little longer between strokes of the steel, at least in theory. In practice, if one is properly using quality sharp knives and properly steeling them, they'll all cut just fine, and hold up about the same. Recently, many European makers have introduced "Asian-style knives, and introduced shallower-beveled knives in their "traditional" models, and I know at least one Asian maker that has introduced a "Western"-style blade. Metaphorically, I liken my Asian blades more to sports cars, my Euro knives more like trucks, if that makes sense...or, since it's a bicycle forum, climbing bike vs. audax bike? But unless one is doing a lot of cutting, the differences in "sharpness" and durability will likely be unnoticed by most. And as hoo noted, blade isn't everything; much like with bikes, the differences between one excellent ride and another end up as personal fit and preferences. E.g., Global knives, an excellent Asian brand, are so sharp one would think they could easily do a rabbi's next bris, but I don't like their narrow handles for my big paws, while Shun, another similarly sharp Asian blade, has D-patterned handles that I really like, so that's what I have for my paring knife (my go-to is a Western-style chef's knife). YMMV. FWIW, at a lot of professional kitchens, processing plants, and other places where they do lots of cutting, management will provide inexpensive stainless steel knives, and have a service re-sharpen them weekly or so (which is about fifty times more often than most consumers would need). All that grinding will wear the knives out in months, vs. decades, but because the knives cost so much less than "good" knives (and are less likely to be stolen), it's worth it to them. *"Sharper" is not without its controversy, too: Asian knife makers will tout the superior "sharpness" of their blade edges, and many consumers find them to be what they'd consider "sharper," but European makers counter than what is perceived as "sharpness" is actually lower friction (the shallower bevel of Asian knives making less contact with the material at the cut), resulting in a blade that passes across the cut surface more smoothly. Make of that what you will. 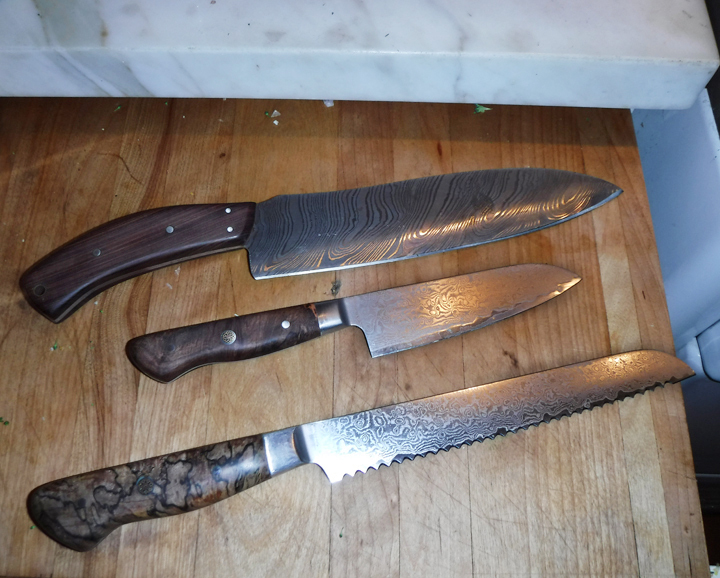 I have some Wusthof and Henckel Knives as well. They cut really well. The bread knife above is amazing and the Santoku, cuts veggies really thin with ease. (the blades are thin) It is a different cutting action than a European Knife so you have to get used to that. My Dad sharpens them to razor sharpness and they hold their edges really well. The Top Knife is more western and is a total brute. The blade is thick, heavy and goes through bone like it isn't there. I reread this entire thread for the forth time, and it's a great one. I especially liked Stan Wilson's shop and his grinding gigs. I use to hand radius titanium feet for turbine blade spacers [delta] on a thin belt sander once out of the 4 step Fadal 5 vice process. Tough to keep heat down on any metal especially running 100 of them a day through that process. Blue made you blue. I'm not into knives at all but I was in Toledo Spain a couple years ago and was blown away by all the knives and knife shops. I suspect much of it was crap for tourists, but there was definitely some good stuff too. And as luck would have it I met some guy at a coffee shop who was on his lunch break from a small knife making place and he invited me to have a look. That was pretty cool. Anyway, just mentioning it to say that anyone who's into knives should make it a point to go to Toledo if they are ever in Spain. Just google Mariano Zamorano. 150 years in business father to son in Toledo. I wonder if it has anything to do with corrida as a major past time back in the days. These have to be the prettiest looking cooking knives Evar. OK, does anybody still sharpen knives? This day in History day...The night of the long knives.